^ RAMses in it’s current state; defunct. I scrapped some bits and pieces for modifications to the Velleman Vertex I’m building, but most of the structure is still there. ^ A test run of the axes. This is the only video of the axes running before the machines untimely demise. While working on the massive Dynamo Death printer, I got horribly bored and decide to take a break from building the printer… and building another printer. If you’re like me, you like to have an objective of everything you do (even if that objective is “Because I freakin’ can!”). 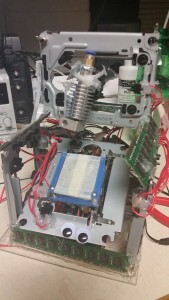 And the objective of this build was to build a 3D printer as cheaply and quickly as possible. I went from having all the parts on my desk to a working CNC machine compatible with Repetier in about 6 hours, and had filament extruding in another 2. The total cost came out to roughly $40-60, but I had most of the stuff lying around. Unlike my other printers, I didn’t care about quality, and just wanted it to work. If something broke off, I just hot glued it back together (the way real engineering should be). Aside from approximately one (1) metric crapton of hot glue to hold the thing together, I scrapped the endstops, motors, and each axis from 4 separate desktop optical disc drives. I used the PISCES 3D printer to make a very minimal Bowden extruder that is basically just a bearing mount with a tension spring and a screw hole, and a I used some spare RAM lying around as structural components. The bed itself was made of laser cut acrylic coated in blue painter’s tape. As I have no heated bed, the only material I have half a prayer of running is PLA and maybe PETG, but whatever. After that I slapped on some Industrial grade googly eyes for good measure and spun her up. This may be one of the worlds smallest FDM 3D printers, with a build area of 35*35*25 mm. However, with a build area like that, all you will really be able to effectively print is a Ring. Maybe. perhaps A Cherry MX key cap? Not much. 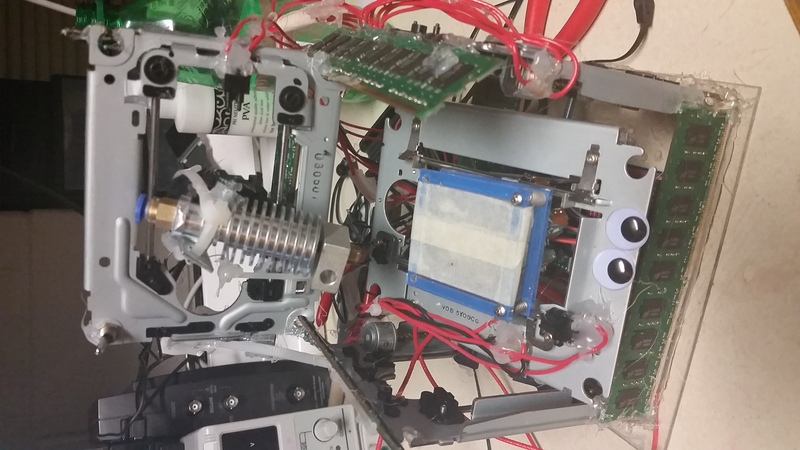 Update: I changed the drivers to A4988s to DRV8825s for more precision, but, blinded by the light of my infinite genius, I forgot to reset the potentiometers, and all of the stepper motors blew out in about 3 seconds. I have spares, but I have to rewire them. Rest in Pastrami, little fella. 5 GB of RAM! That’s more than most of VT’s computers! Dirt cheap demonstration of CNC principles. A hell of a lot of fun to build. Miniscule build area renders this more of a proof of concept than an actual working printer. Seeing as how this build was a joke to begin with, its hard to think of things to do to make it a better joke. Perhaps I should use a smaller hot end so I can get a larger build area, or use different axes. With 3D printers getting more and more hyped, the price is dropping greatly, and for people that just want to see the concept in practice (like a high school), this is a pretty stupid and silly way to make it happen. TL;DR: it works, but not well.